It made me think about how we communicate with people interested in accelerating biomedical research – do we employ a unique language pattern? On the flip side: How should our language change when trying to reach a wider audience (outside our social network), engage new communities and partners? Background: Language has functions that transcend the transmission of information and varies with social context. 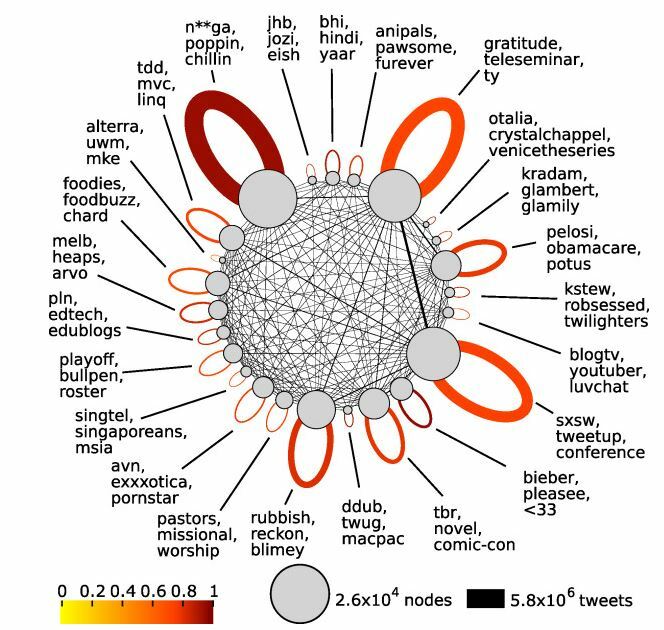 To find out how language and social network structure interlink, we studied communication on Twitter, a broadly-used online messaging service. Results: We show that the network emerging from user communication can be structured into a hierarchy of communities, and that the frequencies of words used within those communities closely replicate this pattern. Consequently, communities can be characterised by their most significantly used words. The words used by an individual user, in turn, can be used to predict the community of which that user is a member. Conclusions: This indicates a relationship between human language and social networks, and suggests that the study of online communication offers vast potential for understanding the fabric of human society. Our approach can be used for enriching community detection with word analysis, which provides the ability to automate the classification of communities in social networks and identify emerging social groups.